Coolpad shows UP DOWN on screen when switch ON. 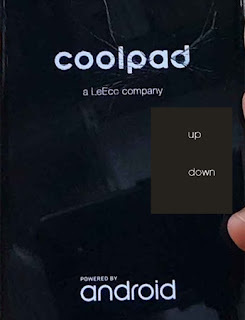 If you are facing this problem after flash Coolpad then here is the complete solution for this, the error you see after flash is "UP DOWN" written on screen and the phone does not switch ON, it just hang on the Coolpad Logo and only shows Up and Down near Volume key. This solution is working on all most all Qualcomm and MediaTek (MTK) Android smart phones and it's tested on Panasonic and Coolpad Qualcomm Android smart phones. If you see Volume Up and Down or Modem on start up screen after flash the Android smart phones, then please follow the below steps. Now type "adb devices" (without quote) and press enter key to see the connected device, if see the device here then enter the below command and press enter.